This unseasonably warm weather – it’s 70s in some parts of the East Coast on Christmas Eve and Christmas Day – has some people literally all hot and bothered and bemoaning the fact that the white Christmas they want will probably be, like the song, in their dreams. “It’s just not Christmas without the snow,” some say. But nothing could be further from the truth. There’s no need to get all in a froth about the lack of frost. Just picture this: the sand, the beach, the palm trees, the warm, blue water. Add copious amounts of food and drink, lots of laughter, lots of cheerful music, lots of dancing. What’s that? Christmas in Puerto Rico. It's fun, it's colorful, and more than anything - it almost goes on forever. The States have the 12 days of Christmas; in Puerto Rico it’s more like the 24/7 days of Christmas, a marathon session of festivities that begins after Thanksgiving and isn’t really over until the end of January. There’s even a name for it: Navidad Borícua (Puerto Rican Christmas), and you’re going to need all your energy to get through it. If you’re trying to conduct any business or find someone in their office, you can pretty much forget about it until way after everyone in the States has taken down the tree and put the decorations away. Even the usual traditions of Christmas and New Year’s are taken to a whole different level on the island. 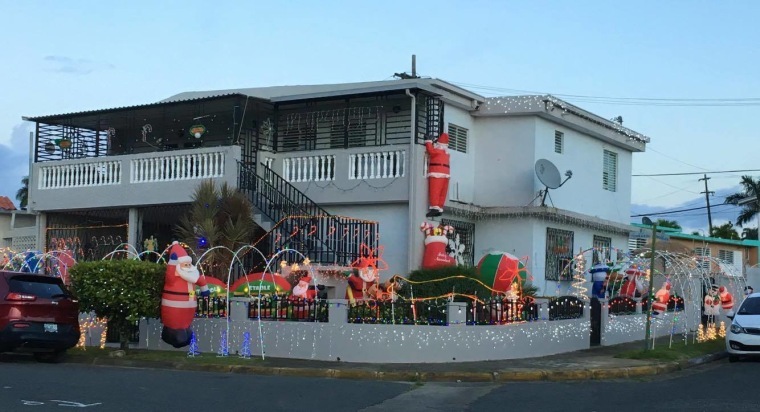 While surely you’ve heard of the tradition of going door-to-door signing Christmas carols, it’s a whole different ball of wax in Puerto Rico. The parranda (party) is Christmas caroling Puerto Rican style. Friends get together at night with tambourines, guitars and other musical instruments, and go from house to house not just to sing, but also to come in and party and hang out for a while before moving on to the next home. But here's the catch, they wait until you're sleeping. In the middle of the night, when you're fast asleep, everyone is gathering at your front door in silence. Until someone yells, ¡ASALTO! (attack, or break-in) and the group starts singing, "Si no me dan de beber, lloro ("If I'm not given a drink I'll start crying") over and over again, until the door is opened. Once you get over the initial scare and hoopla, it’s all good! Traditional holiday foods at parrandas and anywhere during the holiday season consist of roast pork served with arroz con gandules (rice with pigeon peas), plantains, and pasteles, which are like tamales only they’re made using mashed green bananas and yucca as the dough and wrapped in banana leaves. Desserts include turrón (Spanish nougat), arroz con leche (rice cooked with coconut milk, sugar and spices) and tembleque, a custard made with coconut milk. Hands down, though, the big holiday food, if it can be called that, is coquito, a sweet and thick drink made with coconut milk, coconut cream, and rum. Lots of rum. You get the picture. The period between Christmas and New Year’s is a busy time on the island, what with all the partying and eating and hanging out. Again, don’t try to find any office worker, and don’t try to do anything serious. That’s a lost cause, I’m telling you. The Día de los Santos Inocentes (Holy Innocents Day) on December 28 is an old Spanish tradition commemorating the biblical story of Herod ordering the killing of baby boys. Since 1823, the coastal town of Hatillo holds a festival with masks and costumes fashioned to look like Herod’s soldiers, and some men continue the old custom of dressing like women and going from house to house asking for food and drink. The festival includes a parade through town and a big party in the town square, and that’s just one of the many festivals happening in cities and towns throughout the island during the Christmas season. When do the Puerto Rican Christmas festivities end? Try the 22nd - of January! Just like most anywhere else, there’s champagne and cidra (cider) on New Year’s but there’s also the Spanish tradition of eating 12 grapes at the stroke of midnight for good luck, and good luck trying to find grapes on New Year’s Eve in the supermarkets. I knew I wasn’t in Puerto Rico any more the first holiday away when I rushed to the supermarket on New Year’s and found grapes in abundance. Another island tradition is to fill a bucket or large pot with water and throw it out out the door at midnight on New Year’s as a way to “get rid” of all the bad things that may have happened in the old year. While it’s probably not going to be an issue this year with the warm weather, that particular tradition can be hard to transplant, in case you’re interested. Just ask my sister who nearly broke her neck slipping on water that almost instantly froze when she celebrated New Year’s in Syracuse, New York one year. El Día de Reyes (Three Kings Day) on January 6 is like Christmas, a day for presents. But while Christmas is for everyone, Reyes is mostly for the kids, who put grass in a shoebox the night before - food for the Reyes’ camels - and wake up to gifts. Día de Reyes is yet another day where family and friends get together to eat some more and party some more. But wait, it’s not over yet. Get your energy drink ready. While schools open back up after Three Kings Day and adults head back to work, the partying isn’t over, and there isn't a lot of work going on just yet. That’s because of the Octavitas, eight days after Three Kings Day that were originally set aside for religious observance but have since become an extension of the island’s special holiday joie de vivre. God forbid you weren’t home when the parranda came by before, because they’re coming back during the octavitas and you better be there or you’ll never hear the end of it. Really. So now it's mid-January. Think it’s over after the Octavitas? Nope. From January 18 to the 22nd, the Fiestas de la Calle San Sebastián (The San Sebastián Street Parties) take over a large portion of Old San Juan in the island’s capital city. It includes four days of dances, parties, music, art shows, food and drink, and a parade where participants dress up as well-known Puerto Ricans of the past. Old San Juan's plazas are beautifully decorated at night, and there's nothing better than yakking with friends over a rum and coke as the tropical breezes hit your face - at like midnight when you're still out having fun of course. Once that winds down, then and only then it’s the official end of the holiday season. Whew! You should try it sometime. I promise it won’t be depressing or cold. Plus you can go to the beach and recuperate under a palm tree once it’s all over. It may not be a white Christmas, but it’s certainly colorful. It’s Navidad Boricua.